This cache takes you to the overlook of Spruce Tree House and will teach you about the geology behind the alcoves across the canyon and the stone at your feet. There is no physical cache container to find; to log this earthcache, you will need to email or message us the answers to the questions below. The questions are repeated in the unencrypted hint for your convenience. Cell phone cachers, please be advised that service may not be available at the cache site; recommend planning ahead and having the description available before you go. Spruce Tree House is currently closed to tours due to potentially unstable rock. Please DO NOT attempt to enter the ruins without permission. This earthcache was specifically designed so that it could be completed from the overlook. Please stay on paths and obey all park signs and ranger directions. Help preserve what you see here for future generations. Although humans have lived in and around Mesa Verde for about 10,000 years, the cliff dwellings are relatively new in the park's history. 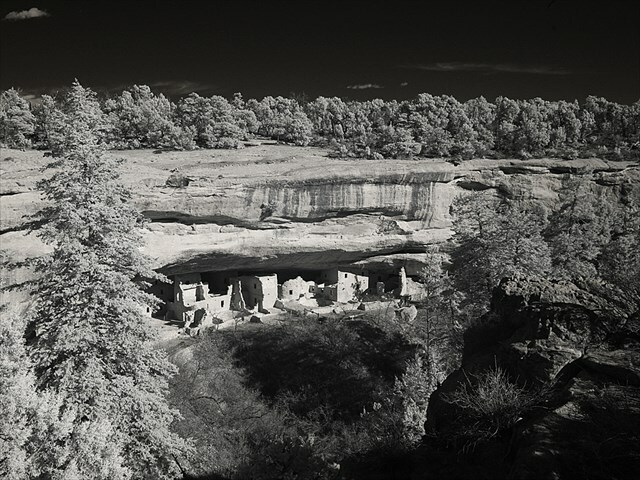 Spruce Tree House is the third largest cliff dwelling in Mesa Verde. Home to between 60 to 80 men, women, and children, the structures consists of around 130 rooms, as well as eight ceremonial kiva chambers. It was built between 750-800 years ago by the ancestors of the Puebloan peoples of the Southwest. The "house" is built into a natural alcove measuring 216 feet (66 meters) at greatest width and 89 feet (27 meters) at its greatest depth. Around 1285, a long period of droughts eventually caused the inhabitants of Spruce Tree House and other Mesa Verde communities to move out in search of a more hospitable environment. Although local Utes knew of the cliff dwellings, they regarded them as sacred sites and did not visit them. In 1888, the Wetherill family, who ranched in the area, learned of ancient ruins. On December 18, 1888, Richard Wetherill and his brother-in-law, Charles Mason, were searching for lost cattle when they were forced to walk their horses in the heavy snowfall. Reaching an overlook, they spotted a large set of ruins tucked in an alcove: Cliff Palace. The Wetherill family explored the rest of the area, finding more and more locations, such as Spruce Tree House. In order to preserve the ruins and protect against looting and vandalism, President Theodore Roosevelt set aside the land as Mesa Verde National Park in 1906. Following excavation, study, and stabilization by the Smithsonian Institute, Spruce Tree House was opened to park visitors in 1908. "Mesa Verde" isn't actually a mesa. The term "mesa" comes from the Spanish word for table; geologically, mesas are isolated, flat-topped highlands with steeply sloping sides or cliffs, topped by a cap of much harder rocks that are resistant to erosion and protect the cliffs and rock beneath from being weathered away. The term "cuesta" is also Spanish, meaning hillside or sloping ground. Mesa Verde is a cuesta, as the land dips 7 degrees to the south. This angle is what helped form the alcoves in the park and gave Spruce Tree House's inhabitants a place to shelter and live. The alcove that covers Spruce Tree House formed as a result of weathering. The Cliff House Sandstone that forms the top layer of the cuesta here was laid down about 80 million years ago, when this area was underwater. Quartz sands settled and were eventually cemented together to form harder rock. There are also layers of denser shale in the Cliff House Sandstone, which is how the alcoves formed. Over the years, rainwater seeped through the relatively porous layer of sandstone until it hit the layer of shale. Since the water could not penetrate the denser shale, it spread out laterally, following the slope of the cuesta until it reached a cliff where the sandstone and shale had both already weathered away. The water then emerges as a seep spring. This groundwater helps form alcoves both through chemical and physical weathering. As water falls through the air, carbon dioxide dissolves into the water and it becomes slightly acidic. The carbonic acid can dissolve the calcium carbonate cement that holds the sand grains together, weakening the bonds and turning the sandstone back into sand. The water in the rocks can also widen cracks through frost wedging. When water freezes, it expands in volume. This pushes the rock apart and can cause it to fracture and break off. Over time, as groundwater collects at a central point, the collective dissolution of the rock and frost wedging creates an alcove. Despite the Park Service's attempts to stabilize the alcove at Spruce Tree House, rock falls still occur here as water causes the alcove to continue to weather and expand. In October 2015, following a rockfall, the Park Service closed Spruce Tree House to visitors until a safety assessment can be done to ensure visitor safety. Until the house reopens, it can be viewed from the viewpoint across the canyon, and this earthcache has been designed so that it can be completed from that vantage point. The dark streaks flowing down the face of the rock are not caused by soot from the fires of the old inhabitants of Spruce Tree House, though the marks inside the alcove's roof were. These streaks on the outer rock are called desert varnish. This stain caused by clay, iron oxide, and manganese oxide often forms on stable rock surfaces that do not get much rain, wind abrasion, or fracturing (hint, hint). For years, scientists assumed that desert varnish was made by minerals leaching out of the underlying rocks. It was not until the 21st century that scientists discovered it was a paper-thin deposit of clays, made by blowing dust. This discovery was made only after varnish was detected on rock surfaces that could not have contained the manganese oxide or iron oxide minerals that make up desert varnish, such as quartz. Desert varnish builds up slowly on rock surfaces, commonly in areas where water flows intermittently over rock surfaces. The former residents of Mesa Verde, as in other locations around the Southwest desert, took advantage of desert varnish by chipping away at varnish-covered sandstone to make petroglyphs. Some examples can be seen down the Petroglyph Trail near Spruce Tree House. CONCRETIONS IN THE SANDSTONE -- WHAT ARE THOSE SHAPES IN THE ROCK? At your feet at the cache coordinates, you can also find another interesting feature in the Cliff House sandstone, concretions. These objects, very different in appearance from the rock around them, are tough, compacted concentrations of minerals that form inside preexisting rock. Concretions develop around an abnormality inside the rock (such as a shell or pebble) that serves as a nucleus, in a way, similar to how pearls form within oysters. As water goes through the rock, minerals can build up around this nucleus, which is not as porous to water as the surrounding sandstone. Concretions are not uncommon in the Cliff House sandstone and are normally made of either calcium carbonate (usually white in appearance) or iron oxide (usually red to rusty brown in appearance). While concretions may be different shapes and sizes, there are some sizable ones at the overlook here -- take a good look at them for question #2 below. To log this earthcache, send us a message (visit link) or an email (visit link) and copy and paste these questions, along with your answers. Please *DO NOT* post the answers in your log, even if encrypted. There's no need to wait for confirmation from us before you log, but we will reply to messages and to emails if you include your email address in the message. Group answers are fine; just let us know who was with you. 2. Go to the cache coordinates and look down at the Cliff House sandstone by your feet for concretions, which should be easily seen and do not resemble the rock around them. Describe the concretions at the overlook (shape, size, color). Based on their appearance, are they made of calcium carbonate or iron oxide? 3. Looking across the canyon: Based on the cache description and your own observations, what signs do you see that the alcove is continuing to weather and expand? 4. Looking around the entire area: Can you see any visible measures that the Park Service has taken to try to protect the ruins and stabilize the alcove? In your view, what measures could they take to stabilize the alcove while preserving its appearance and the structures inside? Photos of your visit are not required but are always appreciated. This earthcache was placed with permission from the National Park Service, and a compliance completion letter is on file with the Mesa Verde National Park administration. [To log this earthcache, send us a message through the link at the top of the cache page or an email through the link in our profile and copy and paste these questions, along with your answers. Please *DO NOT* post the answers in your log, even if encrypted. There's no need to wait for confirmation from us before you log, but we will reply to messages and to emails if you include your email address in the message. Group answers are fine; just let us know who was with you.